Videos of the dialogues with the Jury of the Cultural Innovation International Prize, in the activities "Are you public?" in the award ceremony. 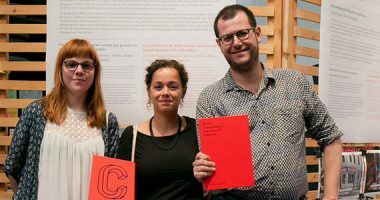 On 10th June a series of talks with members of this year’s jury of this first edition of the Cultural Innovation International Prize, were held at CCCB. They talked about their projects and management experiences and discussed some of the key aspects involved in the activation of cultural audiences. With Nina Simon, Executive Director of the Santa Cruz Museum of Art & History (MAH), and Conxa Rodà, Head of Strategy and Communication at Museu Nacional d’Art de Catalunya (MNAC). With Marcos García, Head of Medialab-Prado. With Mark Miller, convenor of Young People’s Programmes at Tate London. Focusing on the projects accepted for consideration we try to find connections between the submissions. The authors of CulTime and Esdevenir Públic give us details about their proposal.